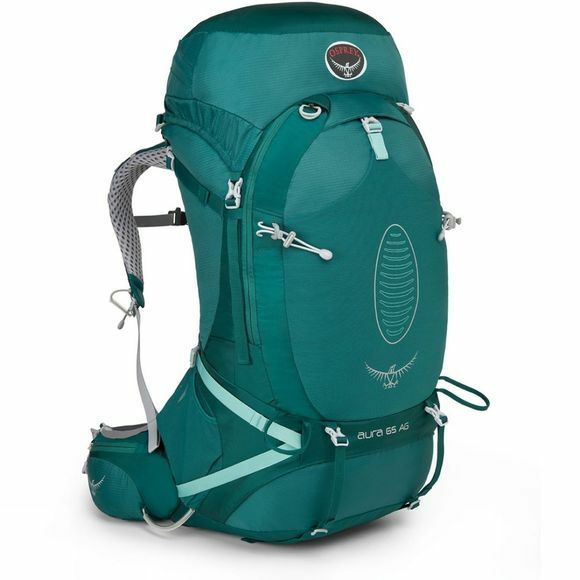 The capacity of classic backpacking sack, the comfort of a mesh-backed daypack: the Aura AG 65. At 65 litres, the Aura has all the space you need for extended backpacking trips or multiday wild camps, and thanks to the AntiGravity 3D suspended mesh backpanel and hipbelt, and the ExoForm/BioStretch harness, you won't mind picking it up and carrying it every day! The adjustability and womens-specific sculpting of the harness allows it to contour comfortably around your body, while the back system takes care of transferring the load to your hips. As well as being famed for the fit of their packs, Osprey are known for constant innovation and development of pack features. The Aura is no exception. A variety of pockets and pouches organise your gear without getting in the way, and a series of ingenious touches – such as the Stow-on-the-Go trekking pole holders – serve to make backpacking life much more easy and convenient.